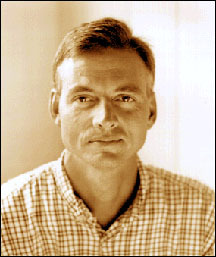 Robert Wright, a visiting scholar at the University of Pennsylvania, is the author of Nonzero: The Logic of Human Destiny (2000) and The Moral Animal: Evolutionary Psychology and Everyday Life (1994), both published by Vintage Books. The Moral Animal was named by the New York Times Book Review as one of the 12 best books of 1994 and has been published in 12 languages. Nonzero was named a New York Times Book Review Notable Book for 2000 and has been published in nine languages. Wright's first book, Three Scientists and Their Gods: Looking for Meaning in an Age of Information (1988) was nominated for a National Book Critics Circle Award. Wright is a contributing editor at New Republic, Time magazine, and Slate. He has also written for the Atlantic Monthly, New Yorker, and New York Times Magazine. He previously worked at The Sciences magazine, where his column "The Information Age" won the National Magazine Award for Essay and Criticism. Wright's plenary lecture scheduled from 10 am-11 am began late at 10:40 am and ended at 11:40 am. Wright's lecture was one of the few non-PowerPoint presentations at the conference. He read slowly from a prepared text, but always had eye contact with the audience. Wright ad-libbed often spontaneously, had a wry-sense of humor, and had the audience laughing continuously. It was one of the most enjoyable talk at the conference. Here are my notes. There is nothing I like better than physical presence (laughter this was in reference to Ray Kurzweil's 3-D Telepresence holographic presentation on Saturday which never materialized due to hi-tech glitches). I faxed my lecture to the fax machine at the Crown Plaza where I was staying. I will not be making a PowerPoint presentation. The hits have shorter and shorter lifetimes. Change is less and less glacial. If change is accelerating, how come we're getting excited only now?  What to do to avoid this?  We need better government. Remember who you first heard this from. What's good for one side is not good for you I won. You lost. If you take off the book cover, you'll find "ZOR"
on the book front of my hard-cover book. and fight off the predators better. hunter-gatherer lead to a global civilization. People have instinct to play for non-zero gain. There is a phase change. Hunter-gatherers became chieftans, created chiefdoms. Need to intervene so equity prevails. People get together to be more productive. Draws into a web of interdependence. Growth in social organization is inevitable. He doesn't bring in the number of human brains. During the Stone Age, more people means more brains. Nature did this to test this hypothesis. The Ice Age separated the Old World from the New World. [ The Strategy of Conflict (1980)] in a YMCA locker room. so it's OK to wage war against them. I stress the importance of doing business with others as humans. Years ago, they want to bomb Japan off the face of the earth. Now, I want my Japanese mini-van, and so do lots of others. Acknowledgement of the other as a moral truth. but we've made progress in the moral realm. showed that countries could cooperate to protect the earth's environment. WTO nations felt that a global economy will benefit the world. Should we invade all countries who have weapons of mass destruction (WMD)? Bin Laden's recruiting video tapes are very effective. make them more happy, care about their welfare. Remove their discontent that leads to terrorism. Moral tolerance needs to be a global norm. "No man can be truly happy unless all are happy." Q: Your moral singularity is the most radical idea I've heard at this conference. How to link this to Bin Laden's terrorism? A: Terrorism introduces us to discontented groups, to primary unhappy groups. Q: I disagree with your view of history as moral progress. Information leads to infinite sum. A: Population growth if we exhaust our fisheries, then we can't eat. Information has this property: that you can give it away and still keep it. Q: I want to provoke you with a view that I don't hold. Empathy as a human quality is a nonzero gain. A: Why human empathy exists? Emotional repetoire extended beyond the family. Reciprocal altruism we feel sorry for people halfway around the globe. Q: Empathy extends even to animal and plants. Rational mind logical extension to wider circles. Q: Have you considered quantum mechanics as analogy to zero or nonzero gain? Here we have unity as the goal. Cooling off of atoms [at 20 nanokelvin] make them coherent. As atoms we're interacting getting us to cool off. Use quantum mechanics as ultimate nature of reality. Metaphor of non-locality leads to global interdependence. A: I'll agree to that. The Q & A ended the plenary session at 11:40 am. Robert Wright received an enthusiatic warm applause from the audience. Pierre Teilhard de Chardin, writing in the mid-twentieth century, declared the world's nascent telecommunications infrastructure "a generalized nervous system" that was giving the human species an "organic unity." Increasingly, humankind constituted a "super-brain," a "brain of brains." The more tightly people were woven into this cerebral tissue, the closer they came to humanity's divinely appointed destiny, "Point Omega." Suppose we grant Wheeler's claim for the sake of argument: an ant colony is an organism. Then why can't we call a human society an organism? Is the key difference the extreme interdependence of ants the fact that some castes of ants would perish were it not for the food-gathering castes? That seems a dubious distinction, given the current interdependence among humans. I depend for my nourishment on the labor of many people I've never met. If you dropped me in the Rocky Mountain wilderness, without anything made by other people no pocket knife, no clothes I'd wind up as bear chow. Far be it for me to make this argument. My aim is more modest: to convince you that, if I did make this argument, it wouldn't be a sign of insanity. The question of transcendent planetary consciousness, whatever the answer, is non-crazy. Oddly, the key to granting the question this legitimacy is to hew to a soberly scientific perspective. Indeed, the more scientific you are in pondering consciousness, the more aware you become to approach cosmic questions in general with a touch of humility. COULD A GIANT GLOBAL BRAIN BECOME CONSCIOUS? "In the 1963 science-fiction story "Dial F for Frankenstein," by Arthur C. Clarke, the world's telecommunications system comes to life. With a global network of satellites having just interlinked the planet's telephone switching systems, all the phones start ringing at once. An autonomous, thinking supermind has been born. When college students sit around late at night and wonder whether a giant global brain could ever be conscious, they usually have a scenario like this in mind. The assumption is that when something reaches consciousness, it starts acting like other conscious things we're familiar with capriciously. But the fact is that, for all we know, the giant global brain the intercontinental web of minds and computers and electronic links already is conscious. At least, that prospect is left distinctly open by the view of consciousness that underlies mainstream behavioral science today. For according to this view, we can never know whether any given thing possesses consciousness. The question of consciousness as I'm defining it here, at least isn't the question of why we think when we talk, and it isn't the question of why we have self-awareness. The question of consciousness is the question of subjective experience in general, ranging from pain to anxiety to epiphany; it is the question of sentience. To phrase the matter in the terminology made famous by the philosopher Thomas Nagel, the question is: Why is it like something to be alive? You might think that this question would get answered in the course of a tome called Consciousness Explained, the much-noted book written by the philosopher Daniel Dennett. But when people such as Dennett try to "explain" consciousness, they usually aren't tackling the question we're asking here. They are trying to explain how a brain could generate consciousness. Whether they succeed is debatable, but in any event our question here isn't how brains generate consciousness, but why why would an aspect of life with no function be an aspect of life in the first place? The mystery of consciousness has lately been underscored by computer science. Though artificial intelligence hasn't advanced at breathtaking speed, there has been progress in automating sensory and cognitive tasks. There are robots that "feel" things and recoil from them, or "see" things and identify them; there are computers that "analyze" chess strategies. And, clearly, everything these robots do can be explained in physical terms, via electronic blips and the like. "Feeling" and "seeing" and "analyzing," these machines suggest, needn't involving sentience. Yet they do in our species at least. Faced with the mystery of consciousness, some people including such philosophers as David Chalmers, author of The Conscious Mind have suggested that the explanation must lie in a kind of metaphysical law" consciousness accompanies particular kinds of information processing. What kinds? Well, that's the question, isn't it? But a not uncommon view is that the information processing needn't be organic. Consciousness may reside in computers, networks of computers, even networks of computers and people. The philosophers who hold this view aren't fuzzy-minded New Agers or reactionary Cartesians or mystical poets like Teilhard himself; they are people who accept a basic premise of modern behavioral science that all causality happens in the physical world and who also appreciate the weirdness that emerges from this premise upon sustained contemplation. Basically, their answer to the question "Could the giant global brain become conscious?" is: We wouldn't know if it were, and for all we know it is. Whether or not you think bacteria are sentient, Teilhard de Chardin did. And, in his view, when individual, mildly sentient cells merged into multicelled organisms, and then acquired a collective brain, consciousness took a great leap forward. And when brainy multicelled organisms us merge into large, thinking webs, constituting another collective brain, a comparable leap could presumably take place. After all, the fact that the connective tissue is now made of electronic stuff, rather than gooey organic stuff, doesn't matter so much if you consider biological and technological evolution part of the same creative process. Writing in 1947, Teilhard marveled at computers and said that radio and TV "already link us all in a sort of etherized universal consciousness." But this was nothing compared to the future, when the links among human minds would grow denser and become truly global, as the "noosphere" matured. He asked: "What sort of current will be generated, what unknown territory will be opened up, when the circuit is suddenly completed?" Subjective experience, according to the premises of modern behavioral science, lacks a function; it is redundant, superfluous. The seeming superfluousness of consciousness has prompted the philosopher David Chalmers to remark, "It seems God could have created the world physically exactly like this one, atom for atom, but with no consciousness at all. And it would have worked just as well. But our universe isn't like that. Our universe has consciousness," For reasons unknown, God decided "to do more work" in order "to put consciousness in." The key bit of effort, so far as Chalmers can tell, was to draft a law assigning consciousness to some, and perhaps all, types of information processing. By "God" Chalmers doesn't mean a guy with a white beard. Most philosophers use the term at least as vaguely as I'm using it: it refers to whoever, whatever if any being, any process specified the laws of the universe. Still, the fact that the one feature of human existence that is of mysterious, even inexplicable, origin is also the central source of life's meaning doesn't exactly discourage speculation about divine beings and higher purpose. And it renders odd the tendency of people convinced of life's meaninglessness to cite, as support, science's having "explained away" the mysteries of life. After all, it isn't just that science hasn't managed to solve the mystery of consciousness. In a sense, science created the mystery of consciousness; the mystery emerges from a hard-nosed, scientific view of behavior and causality. In the New Testament, the Gospel of John begins, "In the beginning was the Word, and the Word was with God, and the Word was God... In him was life." More thatn one science writer of a cosmic bent has juxtaposed this verse suggestively with the modern scientific view of organic evolution: in the beginning was, if not a word, at least a sequence of encoded information of some sort. Fair enough. But if cosmically suggestive juxtaposition is what you're after, you needn't stop here, for the biblical word "Word" is richer than it sounds. It is a translation of the Greek logos, which can indeed mean "word" but can also mean many other things, including "reason." And you might say that, once self-replicating genetic information existed, a line of reasoning, a chain of logic, had been set in motion. A several-billion-year exercise in game theory had commenced. Logos also means "argument," and it is tempting to view biological and cultural evolution somewhat as Hegel viewed human history as a very long argument. Competing ideas about how to organize organic entities clashed. And non-zero-sumness won in the end. One scholar has rendered logo as the "point," the "purpose" the end that one has in mind. And, indeed, the religiously inclined might speculate that the spiritual corollary of the triumph of non-zero-sumness the expansion of humanity's moral compass was the purpose of history's game-theoretical argument all along. In the beginning, you might say, was the end, and the end was a basic truth the equal moral status of all human beings. The idea that a kind of logos might be the force guiding a directional history is far from new. In fact, this was the theory of Philo of Alexandria, member of an ancient philosophical school that some scholars believe was the conduit through which logos entered Christian scripture. Permeating human history, Philo said, was a "divine Logos," a rational principle that was immanent in the world but, at the same time, was part of God's transcendent mind. And in what direction was Logos moving history, in Philo's view? "The whole world," he wrote, "may become, as it were, one city and enjoy the best of polities, a democracy." Not bad, as two-thousand-year-old predictions go. Of course, Philo didn't have access to game theory, so he couldn't talk about non-zero-sumness. Then again, game theorists weren't the first people to recognize the logic of interdependence, and Philo certainly grasped it. Mutual need, he believed, was what wove God's diverse creatures people, plants, animals into a whole. God "has made none of these particular things complete in itself, so that it should have no need at all of other things," Philo wrote. "Thus through the desire to obtain what it needs, it must perforce approach that which can supply its needs, and this approach must be mutual and reciprocal. Thus through reciprocity and combination, even as a lyre is formed of unlike notes, God meant that they should come to fellowship and concord and form a single harmony, and that a universal give-and-take should govern them, and lead up to the consummation of the whole world." In real life, of course, the story has been more complex than Philo's story. In a sense, it has been a better story not better in moral terms, but better in literary terms, in dramatic terms. It has featured, ever since the first bacterium, growing knowledge and, with the arrival of human beings, growing self-knowledge. It has also featured amity and strife, good and evil the two forces vying with each other, yet inextricably bound together. And now, in the past century, as knowledge has grown exponentially, so have the stakes of this contest. More than ever, there is the real chance of either good or evil actually prevailing on a global scale. War and other forms of mass slaughter, other manifestations of massive hatred, could be ended or, on the other hand, they could set new records for death and destruction; they could even, conceivably, end us. And the outcome may hinge on the further spread of knowledge not just empirical knowledge, but moral knowledge. Talk about a page turner! Maybe, in the end, this is the best argument for higher purpose: that the history of life on earth is too good a story not to have been written. But, whether or not you believe the story indeed has a cosmic author, one thing seems clear: it is our story. As its lead lead characters, we can't escape its implications.  Non Zero Website: Sample Chapters from the Book & Excerpts from Book Reviews.